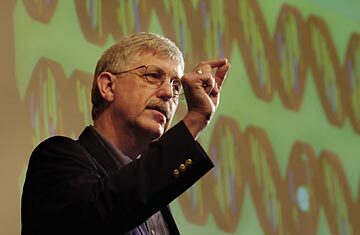 Biologist Francis S. Collins led the international Human Genome Project that in 2003 finished mapping the 3.1 billion chemical base pairs in humanity's DNA. For many young Christians, the moment they first notice discrepancies in the Biblical tales they've faithfully studied is a rite of passage: e.g., if Adam and Eve were the first humans, and they had two sons  where did Cain's wife come from? The revelation that everything in the Bible may not have happened exactly as written can be startling. And when the discovery comes along with scientific evidence of evolution and the actual age of planet Earth, it can prompt a full-blown spiritual crisis. After his best-selling The Language of God came out three years ago, Collins began receiving thousands of e-mails  primarily from other Evangelicals  asking questions about how to reconcile scriptural teachings with scientific evidence. "Many of these Christians have been taught that evolution is wrong," Collins explains. "They go to college and get exposed to data, and then they're thrust into personal crises of great intensity. If the church was wrong about the origins of life, was it wrong about everything? Some of them walk away from science or faith  or both." Collins, 59, who with his mustache and shock of gray hair looks like former U.N. Ambassador John Bolton's cheerful twin, seems genuinely pained by the idea that science could be viewed as a threat to religion, or religion to science. And so he decided to gather a group of theologians and scientists to create the BioLogos Foundation in order to foster dialogue between the two sides. The name  combining bios (Greek for "life") and logos ("the word")  is also what Collins calls his blended theory of evolution and creation, an approach he hopes can replace intelligent design, which he derides as "not a scientific proposal" and "not good theology either." A large slice of the questions deal with Genesis, the first book in both Christian and Jewish Scriptures, and the text that explains the creation and population of Earth, and well as the relationship between God and man. Some answers are straightforward, as with the mystery of where Cain's wife came from. "The scientific evidence suggests a dramatically larger population at this point in history," conclude Collins and his colleagues. One possible explanation they offer  an idea that was embraced by C.S. Lewis, among others  is that human-like creatures had evolved to the point where they had the mental capacity to reason; God then endowed them to distinguish between good and evil, and in that way they became "in the image of God." But on other topics, such as whether Adam and Eve were real people or when humans became creatures with souls, BioLogos offers several possible answers  an approach that is either refreshing or unsatisfying, depending on one's need for certainty. "We cannot say that Adam and Eve were formed as acts of special creation," Collins explains. "That is a troubling conclusion for many people." "Science can't be put together with a literalist interpretation of Genesis," he continues. "For one thing, there are two different versions of the creation story"  in Genesis 1 and 2  "so right from the start, you're already in trouble." Christians should think of Genesis "not as a book about science but about the nature of God and the nature of humans," Collins believes. "Evolution gives us the 'how,' but we need the Bible to understand the 'why' of our creation." See pictures of Pope Benedict's fashion looks.